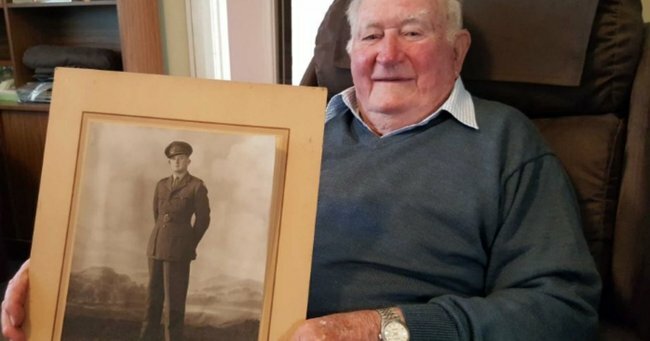 ANZAC remembers fallen friend after keeping his wallet safe for 50 years. 'I bawled my eyes out all night': WWII soldier keeps fallen friend's wallet for 50 years. Harry Lock often thinks about the scorching days and freezing nights he spent sheltering from relentless bombings and gunfire as a ‘rat’ in the trenches of Tobruk. Now 96, Mr Lock still lives in the home he bought in Renmark, South Australia, soon after the war finished — a far cry from the bloody battlefields of northern Africa. “When I’m sitting here by myself, my memory goes back a lot, thinking of what happened,” he said. “We left from our jobs [in Australia] and the next minute we were fighting… and with only two or three months’ training. “The bombing happened every day and I think it was recorded that we were bombed more than England was bombed during the war. Mr Lock said he had never been able to forget the moment his friend Glanville Allan Porter was killed during the Siege of Tobruk. “[Going into battle], we were informed that we were going to be supported by six British tanks,” he recalled. Mr Lock said back in the trenches, his number two on the gun, Allan, used a box of magazines to shield his head from the attack. “Next minute, we got a burst of machinegun fire and a bullet went through the box of magazines — through his shield — and killed him, instantly,” he said. “Because he was so close, only in arm’s reach, that’s when I leant over and took his wallet. After the war finished, Mr Lock held on to his friend’s wallet for several decades, hoping he may eventually learn something about the Porter family. In 1995, Mr Lock received a call from Allan Porter’s younger brother. “He said ‘My name’s Porter’… and he asked if I knew anything about his brother,” Mr Lock said. Not long after, Mr Porter’s family visited Renmark and Mr Lock was able to return his friend’s wallet. “The reaction was terrific… and [he] still talks about it because there were photos of [Allan Porter] and myself and some of the other boys [in the wallet],” Mr Lock said. The Rats of Tobruk remain legends of Australia’s military history — but there are few left who experienced the fearful campaign. “For eight months, they withstood multiple attacks from the German and Italian forces and they held Tobruk, which was a key port and a key military installation in Libya,” Australian War Memorial senior historian Dr Karl James said. “Many of the Rats of Tobruk went to fight at El Alamein, and Alamein was really one of the turning points of the Second World War. “You had the Nazi propaganda describing them as living in rat-like conditions, so the defenders took it on the chin, appropriated the term and took on the name. Mr Lock said he was extremely proud to be a Rat of Tobruk at Anzac Day commemorations every year. “I thought we did a marvellous job,” he said.